The Window List command presents a pop-up dialog containing the names of all currently open windows. A count of the windows is displayed at the top of the dialog. Double-click or press Enter to make the selected window active. Right-clicking provides access to the Window List context menu. This menu provides options to Save, switch to, minimize, maximize, restore or close the selected window. The Delete key can be used to close the selected file. The content of the Window List can be sorted by clicking on any of the field headers at the top of the listbox control. A second click on the same header reverses the order of the sort. 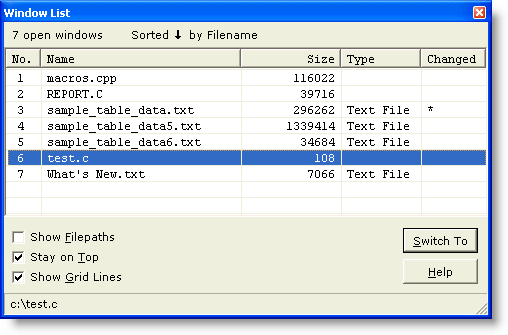 The Window List dialog is resizeable so it can accommodate long filepaths. The window is non-modal so that it can remain open while focus returns to an editor window. Boxer's File Tabs also provide another method of switching among open windows, as do the Window Next and Window Previous commands. If the Window List is left on-screen when Boxer is closed, it will be automatically reopened if the edit session is later restored.